Here's how to make an olive oil infusion using organic spices for a delicious salad dressing or to drizzle on freshly baked bread. or for a great gift. Grind your herbs loosely using a mortar and pestle. Drop your ground herbs into a cruet or other decorative bottle. Add a sprig or two of the whole herb as well to make the oil attractive, and so that your herb flavored oils are easily recognized. Using a funnel, pour the olive oil into the bottle and seal the bottle tightly. 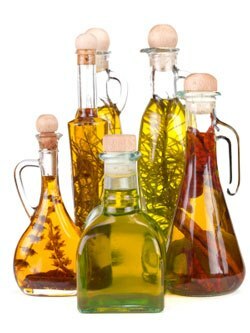 You can use these oils for salad dressings and as a marinade for fish, meats and vegetables. Or just drizzle these oils on freshly baked bread.